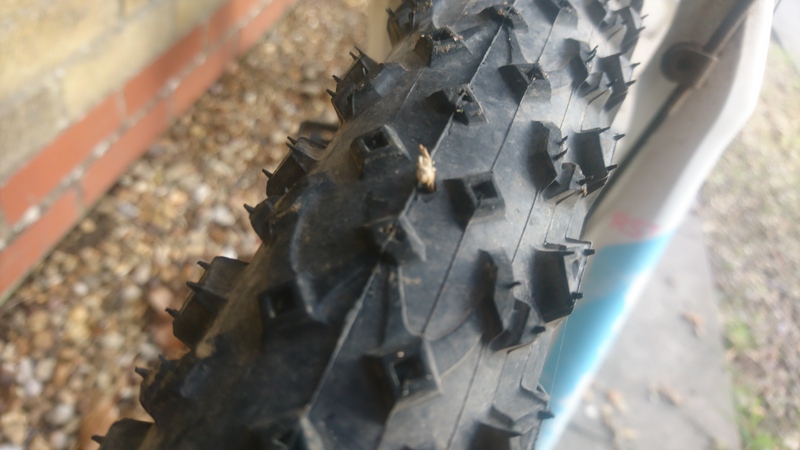 I’m a big fan of tubeless tyres and have them on both my road bike and my mountain bike. I can understand why people might not see the benefit or need on a road bike but on a mountain bike they can be a real ride-saver. Here in this post I show why. I went for a bike ride with my wife some weeks back, just cycle paths to a local cafe, nothing extreme. But on the way back we must have ridden through some thorny hedge trimmings because the following morning when my wife went to get her bike out of the garage for work, one of her tyres was flat. She went by car and I repaired the puncture later on. The thorn in question had gone through both sides of the inner tube and I had to use two patches to get her back on her bike. She then recounted how, in retrospect, the bike did feel strange towards the end of the ride. So clearly it had begun deflating near the end of our ride – had this been a longer ride or had the thorn been ridden over early on then a trail-side repair would have been necessary. Or worst case scenario, some other form of transport home! After that same ride I put my bike away in the garage and thought nothing of it. Sure when I was repairing my wife’s bike I glanced across at mine and checked the tyre’s had pressure in them. Also when I go into the garage I often give the tyres a quick squeeze as I go past and I didn’t notice anything untoward. So it wasn’t until a week or so later that I spotted a thorn and bit of attached branch sticking out of my rear tyre. 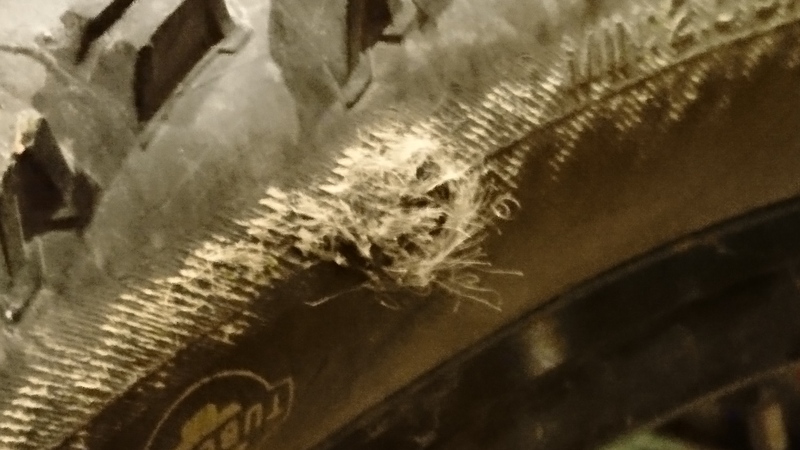 It seems that on that same ride I too had got a thorn in my tyre, the difference being that mine had stayed up and was now continuing to remain inflated even weeks later. This really is one of the main benefits of tubeless on a mountain bike. You’re not immune to punctures entirely but you stand a much better chance of completing your rides without having to do trail side repairs. In fact thinking back I cannot remember having to do any trail-side puncture repairs on this pair of tyres at all. That’s over 5 years and over 10,000 km of trouble free riding. Sure I’ve had thorns in the past that I’ve removed and had to reseal the holes but always done at home when I’ve chosen to. I could have just left the thorn where it was I suppose. It would have continued to remain sealed in the rubber unless something dislodged it. The danger there being that I find myself on a long ride somewhere and it does indeed get dislodged. I do carry a spare inner tube anyway, so it wouldn’t be an actual disaster though all the same. But on this particular day I was in thorn pulling mood. Watch the video below to see the result. Note, that I hadn’t topped up the sealant for a couple of years so all that appears to come out of the hole is a dribble of muddy water. Well that was quite a gust. The tyre was flat in seconds. 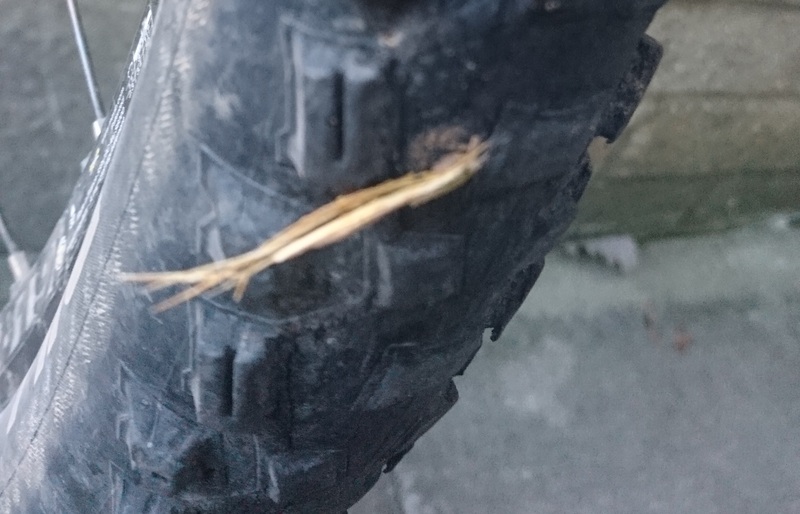 As a result of not having kept on top of the sealant in the tyre regularly which I know a lot of riders of tubeless tyres do, this particular hole didn’t self seal straight away which would have been a nice end to the video. However I didn’t then have to take the tyre off at all to get it to seal and pump up to pressure. All I did was put a bit of fresh sealant in (20 mL of Caffelatex) added a bit of air and rotated the hole to the bottom. Then let the sealant do it’s work. I take out the valve core (use a tool like this) and use a 10 mL syringe (like this) to put the sealant into the tyre. It does cause a bit of a mess on the floor as it dribbles out of the hole to start with but I just mop it up afterwards, I’m in the garage anyway so it’s not like I’m doing this in a lounge or kitchen. I then left it sat like that overnight and pumped it up again. Now I have a tyre back up to 30 psi and holding pressure really well. This is over my usual riding pressure, so I have no need to pump it any further. If the tyre didn’t hold pressure then the solution would have been to remove it from the rim and put a patch on the inside of the tyre. You can get patches that are made specifically for tyres rather than tubes – like these. As it happens in my example, this tyre is well past it’s best anyway. You can see in the photos that the rubber has crazed and the central tread is almost non-existent so it’s new tyre time anyway. I will probably change the tyres over to a new set in the New Year. Also I noticed a bulge on the tyre side wall where the casing threads are coming out too. So I’ve bought myself a new set of tubeless ready tyres and will be fitting them shortly. If you’ve been following my Twitter feed you’ll know the make and model, to be fair the range of options are now quite limited for a bike still on the old 26″ wheel size and with the requirement of ‘tubeless ready’. Once I’ve fitted them I’ll do an initial impressions review on here so watch out for that coming soon!